How to Learn Polish for Beginners. DETAILED Guide. Want to learn Polish? Great Let’s start with easy stuff. You’ll learn the REAL, GUARANTEED way to learn Polish so you don’t fail. What else? You’ll start speaking with must-know Polish phrases. I also include FREE Audio, PDF & Video lessons here. If you find this useful, please email it to a friend! Let’s go. How to Learn Polish for Beginners. A DETAILED Guide. Is it Hard to Learn Polish? Why Should You Learn Polish? Polish is an Indo-European language with about 55 million speakers world wide. Obviously spoken in Poland. Unlike most Slavic languages, Polish doesn’t use Cyrillic letters… but Latin letters. But it also has 9 extra letters – ą, ć, ę, ł, ń, ó, ś, ź, ż.
Here’s what the Polish Alphabet is like. You’ll learn more in Part 6. Let’s keep it easy for now. 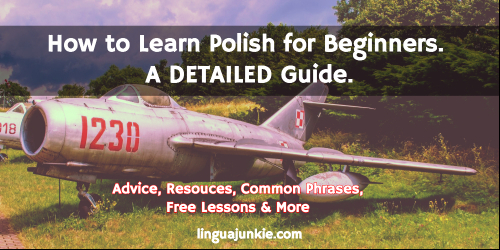 Skip below to part 5 for the audio lesson and hear how Polish sounds like. 2) Is it Hard to Learn Polish? My answer? It’s as easy as you think it is. Yes, the sounds and the words and grammar are different. But if you’re approaching it from “yes, I can learn it if I apply enough time and consistency,” you’re good to go. If you think “nah, sounds too hard,” well, you killed your learning right here. Polish is easy for people that know a Slavic language… like Bulgarian or Russian. Why? Similar words and sounds. There are similarities. It can be tough if you’re an English speaker. Why? Same reason why Japanese are Korean are challenging – they’re NOT similar to English. Lots of new things to learn. Nothing to relate to. Don’t let that scare you. Millions are learning Japanese and Korean right now. They’re learning out of interest. And they’re succeeding. Simply because they like it, they want to learn and they are positive about it. So, Polish is very, very realistic. 3. Why Should You Learn Polish? If you’re reading this, you already know the answer. I can’t convince you. But… I can show you why others learn Polish. Why? Most do it for people: friends, family, lovers and Slavic people that want to get to know their Slavic neighbors. Others want to get in touch with their heritage. Hi, I’m bilingual in Spanish and English but as my granddad was Polish looking to learn to speak it too. My boyfriend is polish and is only right I learn the language in order to communicate. I’m Russian. I like to learn foreign languages and started to learn Polish since 2007. I’m Polish, but I was raised in California since I was four. I would really like to bring back my mother tongue. What about you? Leave me a comment. Let’s say you said “yes, I can learn it!” for Part 2. Nice! Learn 100 Polish words this month. By July 31st (or whenever). Master the Alphabet in 1 week. By December 15th. Speak Polish for 1 minute this month. By December 31st. Write out a 5 sentence self-introduction in Polish in 1 week. By Dec 4th. Pay attention here. All of these are measurable. Either you can speak 1 minute or know 100 words… or you don’t. Plus the goals are small and easy – what’s learning 100 words in a month? That’s like learning 3-5 words a day! Finally, the deadline gives you a date to aim for. Either you hit it or miss it. Set goals like this and you WILL succeed. Small, measurable goals are easy; you know when you hit them. Big vague goals… like fluency are not. Would you ever know when you hit fluency? No! Arguably, I’m not even fluent in English… but here we are! Let’s learn Polish phrases so you can speak a bit. I won’t leave you wanting more. Below, is a free Polish Lesson from PolishPod101.com (an online Polish learning course with Audio & Video Lessons – click here to check it out.) Press the play button. 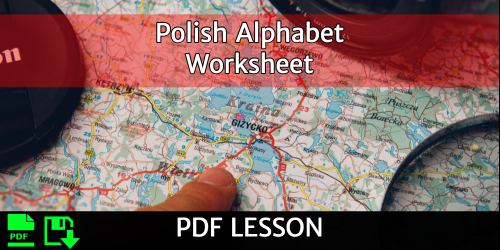 Want to learn how to write the Polish Alphabet? Below is a FREE PDF Lesson – that you should print. Basically, it’s a reference guide to the letters and their sounds. Do you really need to practice writing them? Yeah, why not… but the letters are pretty much the same as English. So, you’ve mastered about 80% of it already. Now that you know how to learn successfully, you can get some REAL learning material. So, what do I suggest? A) Textbooks. 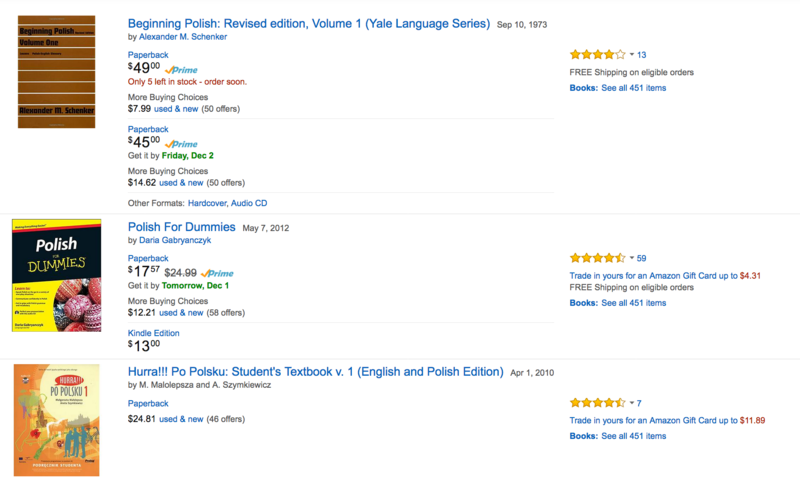 Go to Amazon.com (click here) for Polish textbooks – take a look for yourself and see what has the best ratings and prices. Textbooks are a safe way to learn… (even if they’re a little boring). B) PolishPod101. 100s of Audio & Video Lessons by Polish Teachers. It’s an online Polish learning website and course. Great for Beginners and lets you learn at your pace. They have a ton of Audio & Video courses from Beginner level to Advanced. You get new lessons every week so they’re always growing. So, if you know NO Polish, it’s a great first step. So since we’re learning basics – let’s just do the numbers 1 to 10 in Polish. If you want to hear how they sound, play the video below. Play the video (another useful PolishPod101 lesson) to hear the numbers. I’ll update this guide as I go along. Right now, this is just for starters. P.S. Again, I recommend this for Polish learners. If you want to learn Polish with 600+ audio/video lessons by Polish teachers and voice actors – as well as study tools and apps – this is a good online learning system –- Sign up for free at PolishPod101 (click here).